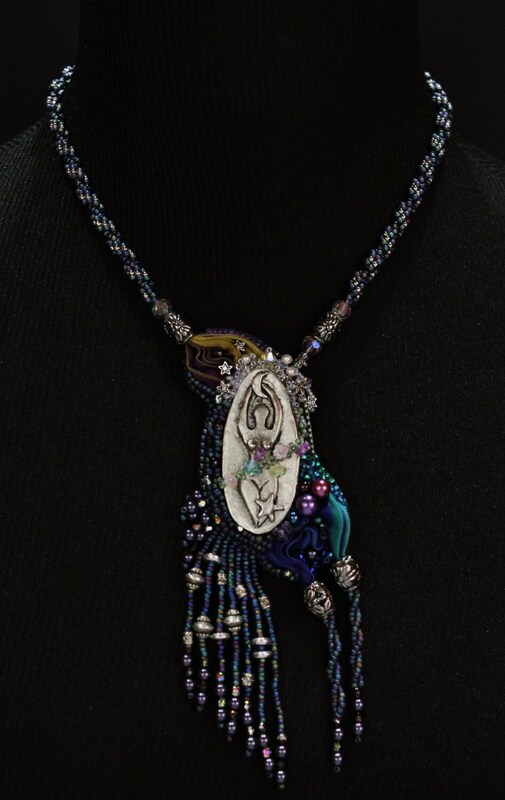 This beautiful sterling silver goddess has been bead embroidered on a flowing piece of Shibori Ribbon that just give the feel of dance. Each tiny bead has been hand sewn in just the right place and backed in Ultra Suede. The dancer is has a draping fringe on one side with a twisted fringe on the other giving the A symmetrical design just the right amount of balance. The rope is a woven twist with a silver toggle clasp, mirroring the twisted fringe. This one of a kind piece gives off a very feminine and romantic feel. Total necklace length is 18" around neck.